Hello all. 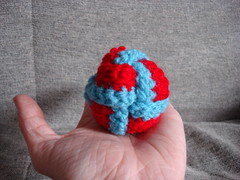 I just joined the crochet along because I am a huge fan of small projects, and I have been crocheting up a storm lately. 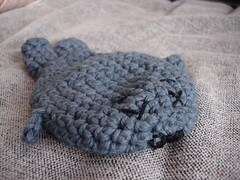 Last week I bought a Japanese crochet book called ‘Mahou no tawashi’ which means ‘Magic Scrubber.’ The term tawashi is generally applied to any handmade dish scrubber. The book is in Japanese (which I do not read or speak) but the patterns are all charted and are easily decipherable. Most of the projects I have tried take under an hour, and are useful! 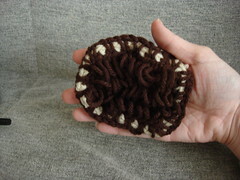 I made most of mine out of old scritchy-scratchy acrylic yarn and they really do work for scrubbing your dishes! I think this one is for dusting. At least that is what I am going to use it for. If you want to take a stab at a Japanese crochet pattern, there are a few available online (look for the adobe .pdf links at the bottom of the pages). I like the one in the middle…….. Welcome to the group, Karrie! How on earth do you make the one in the middle? It looks so cool! Those are really cool!I absolutely love the first one! Seems so perfect for dusting! There is a website that sells a tan of books of Japanese small objects. This place sells only Japanese knitting books and Japanese yarns. Yarns are only sold to retailers right now, but it will be distributed to individuals soon or later!